The contents of this swelling, which typically occurs on the dorsal side of the distal interphalangeal joint (DIP) of a finger, are transparent. The cyst is usually caused by underlying cartilage degeneration or osteoarthritis of the joint. 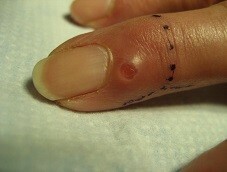 It is advised not to prick the cyst because of its immediate connection to the joint and the possible risk of infection. The cyst is surgically removed and the defect is covered with a local bilobed flap: called the ‘lambeau bilobé’. This procedure is performed under a local ring anaesthetic and after surgery relative immobilisation is achieved using a Zimmer patella for two weeks or so. The risk of recurrence is also high with this cyst.